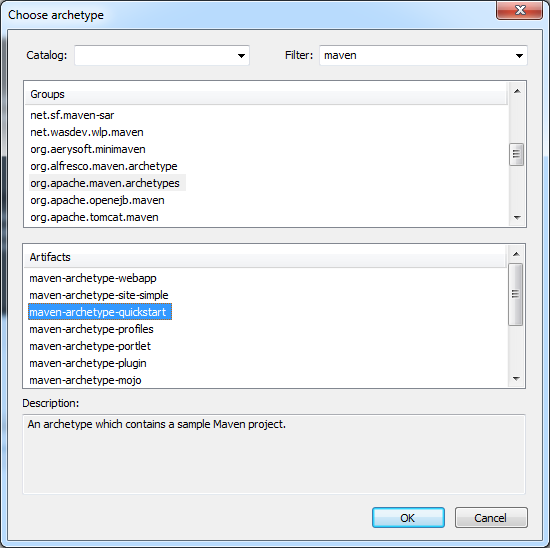 Choose the Maven archetype template. An archetype is a project template in Maven terminology. Later you will be presented a list of available archetypes. But first you need to configure the project name, which is, by convention, equal to the artifact identifier of the Maven project. Group identifier: a name for logical group of projects. Can be constructed of many parts separated with dots. Usually contains a company/organization name as well as some grouping name within the organization. For example, org.apache.maven.archetypes. Artifact identifier: proper project name. 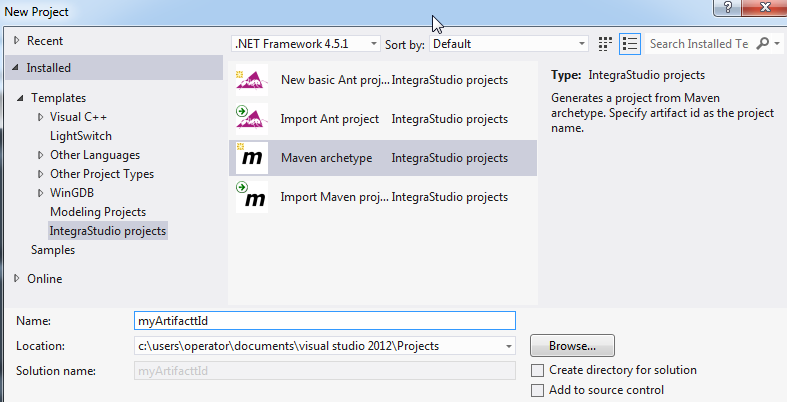 In current version of IntegraStudio it is also fixed as the project name in Visual Studio. Version: some version signature. Allows to develop multiple versions of same project and then to distinguish them when specifying dependencies. You can use Filter box to narrow the list of the groups, as the list is actually quite long. 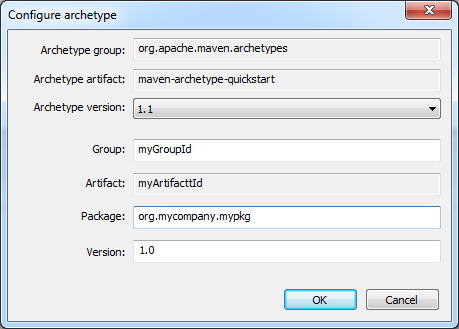 An example archetype corresponding to a simple "Hello world" project is named maven-archetype-quickstart and resides in org.apache.maven.archetypes group (archetypes also follow the naming scheme presented above). You can choose this, or any other available archetype. Click OK and a new window will be shown, allowing you to enter remaining parameters. You can also add properties to this list or remove existing ones. Beware that for archetype properties IntegraStudio does not have enough information to check the correctnes of the values you enter. In case of mistake you will get an error message from Maven during creation of the project. These messages can be uninformative sometimes. 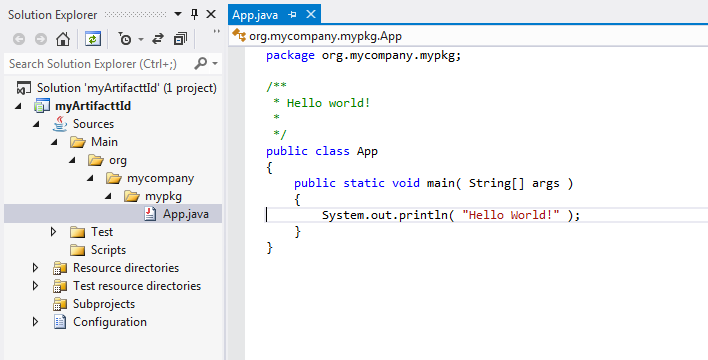 You need to consult the archetype documentation in such case, as IntegraStudio only displays the message it got from Maven and does not know the nature of the problem. Also note that archetypes are retrieved from the network and are not the part of IntegraStudio. They are contributed by various users from the community. Some archetypes may be buggy. In case of problems, try to find documentation of particular archetype. The most likely cause is wrong (or missing) value of some property. If still no success, a good thing to do would be to run the archetype from command line (mvn archetype:generate) to rule out the influence of IntegraStudio. If the archetype behaves the same, you need to contact its author or ask on some public forum how to use that archetype. You can find more info on archetypes in this section of Maven docs.